Apparently, I inadvertantly developed and contracted a new disease called the "Multi-tasking Obsessed Mother". As a woman, I find it very easy to multi-task, and it just sort of seems to come naturally without much thought. Actually, there is scientific evidence to prove it; once again, just google it! At work, I can be on the phone, writing an email, listening to a webinar, journaling money and, of course, blogging and stalking on facebook all without missing a beat. Seems harmless, right? Wrong. What's bad is that I have noticed that I multi-task in everything. This has become a habit that needs some balancing. Let me tell you why. While it may be a great strength at work, it is more of a weakness in other areas of my life. Last week, Javin and Kadi asked me to go sit on the couch to cuddle while we watched a movie. Sounded good to me! Time to relax. So, I sat down, got my IPAD (because I am addicted to Words With Friends), grabbed my cell to return a few texts (because the world will end if I don't), mostly paid attention to the movie and put my other arm around Kadi while I also sat next to Javin. Then Kadi said, "Can't you just spend time cuddling us?" Just then Javin proceeded to take my IPAD and put it on the table. They wanted my full focus, not some lame, half-baked attempt at quality time characterized by my divided attentions. I quickly apologized, squeezed them and reassured them that they were well deserving of my full focus and affections. They wanted and needed JUST ME. That is when I realized that there was a problem. I began to think about another area of my life, the spiritual part. I noticed that I do the exact same thing to God. I will put on some P&W music, sing, read a Scripture, pray and still try to listen all at the same time. I guess I assume that God will talk louder than my singing. Sometimes He actually has, but how much more could I hear the still, small whisper if I didn't have all the background noise? Oh, and I forgot to mention that most of my quiet time occurs early in the morning at the office, so I may get interrupted by a phone call or two. And though my heart may be right and my intentions pure, I am actually being counterproductive. Additionally, I realized that in all of my selfishness and despite the fact that I know He can be wholly devoted to each person individually, I still expect God to focus on just me and not the billion or so other people on the planet. Ironically, that is exactly what he wants from me, too. Since I am not God, maybe I should just leave the multi-tasking up to Him. So, I have been trying a new approach. My quiet time is now spent in my car with the radio OFF. This keeps me from getting distracted when I feel the urge to sing harmonies to every song that I've already heard a thousand times anyway! Instead, I get to focus on just prayer or just intimate worship. I make myself spend time in the awkward silence while I sit back and listen. It's amazing what you can hear when you're not talking! And like I did with my kids, I am letting Him know that he is important enough to me to deserve my full attention. Sometimes the truth hurts. Multi-tasking is good as long as it's done at the right time, in the right environment. I am still learning those differences, but making progress! 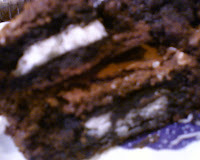 Today is my boss' birthday, so I thought that I would bake him something that included all of his favorite things: brownies, ice cream and Oreos! He loved them, as did my family! I ended up having to make two batches. They are very easy to make and would be a big hit at your next event. Brownies can get boring, so let's make them interesting...and delicious. To make it even better, add a scoop of ice cream and drizzle on some more hot fudge! Mmm...Forget counting the fat grams. If you've already read this far, you may as well just make them!